and a pool in my mother's neighborhood, we felt it was time for the girls to have some swim lessons. They did great for their first lesson. Sure, Bean has been in a pool before, but hasn't ever had any real lessons to know how to do more than splash around. Bug, however hasn't been in anything but a bathtub. And it was actually a big deal for Bug because she H A T E S having water in her face and washing her hair usually results in screaming. They are both looking forward to tomorrow! Hope they have a great time :) Maybe they will be swimming like fish before summer!! Oh MY! Your destination looks like a BLAST. Awww...so cute!!!!! 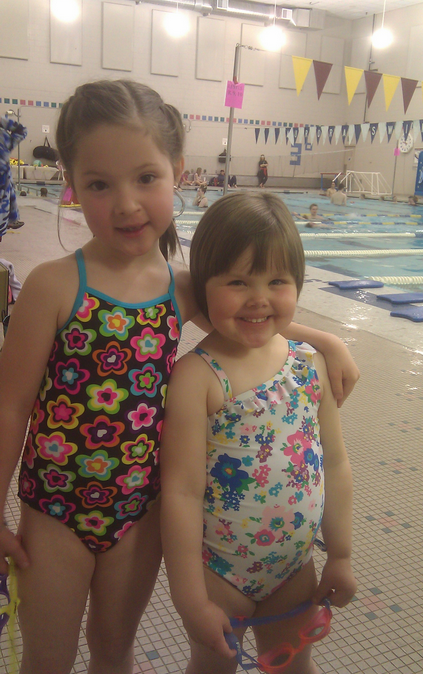 Yay for swim lessons!!!!!! !